Franklin - My golden, Franklin and I first attended your school back in June of 2004. I attended puppy kindergarten through Bare Basic II. I wanted to just send you an email to say thank you. I was sitting down the other morning drinking a cup of coffee and you came to mind. Franklin is now on two vitamins once a day and ear drops for allergies twice a day. One of the vitamins he has to swallow and he never gives me any trouble taking it. Then I tell him to go lay down time for ear drops. (because of sit, down, and flat I am able to do this all though I don't have to say this anymore he knows the routine). Then it's time to flip over to the other side. I tell him to switch and he does. Franklin is so good with my four month old, Kylie. We have taught him not to go into the nursery. If the door bell rings he barks (the only time that he will bark) and runs to look for her. I'm teaching him only to lick her toes. He is doing well with this every once in awhile he has a slip up but for the most part he is catching on. He will not walk on her blankets he walks around them. He may pick up our socks if we leave them on the floor but he will not pick up one of my daughters toys. 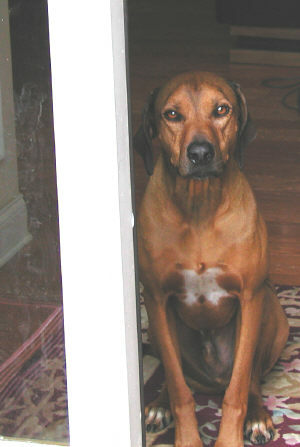 Leah, I took Cooper, my Rhodesian Ridgeback, through your puppy and (Bare Basics) classes a few years ago. I am so glad I took these classes and feel strongly that even seasoned people could use them. I walk Cooper and his sister (with one hand) and rarely have any pulling. 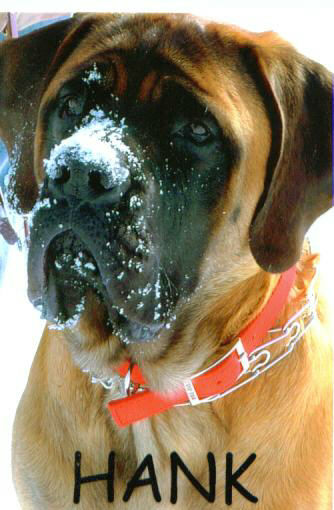 If I see another dog, cat, squirrel before they do, they are put in the sit position until whatever it is passes. I am forever recommending you to all who compliment me on Cooper's manners. 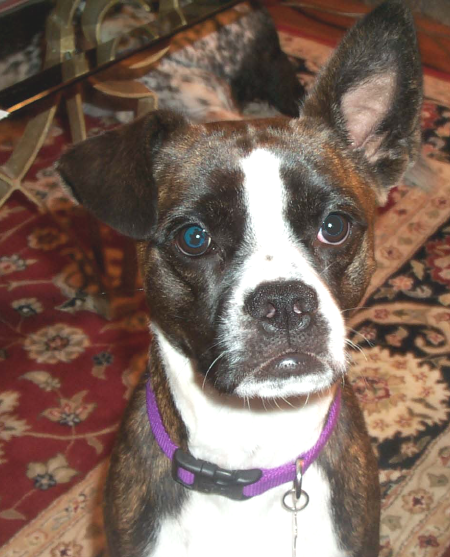 Bowie - We would love to thank you, Leah, for helping Bowie become a part of our family. We got Bowie when my twin boys were 2 and a half. We had to keep Bowie separate from them much of the day because he would get a little too crazy. After going through Puppy Kindergarten and Bare Basics, he is able to play with the boys and stay around the family as much as he wants. The commands that he learned have stuck with him and we all use them whenever needed. 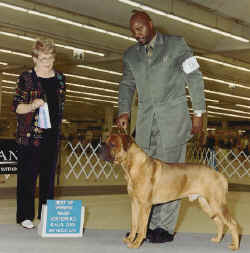 I have had dogs in my family all my life, but had never taken one to a training class. 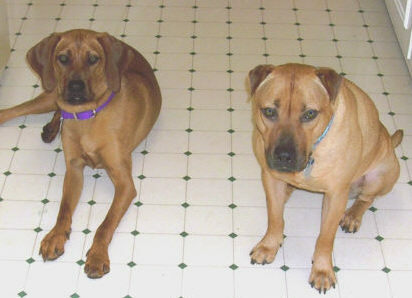 Our dogs, needless to say, ran the household. 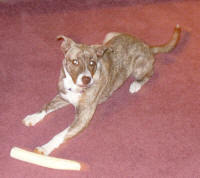 When we got Cricket, she was approximately 2 years old, a runaway, living in a foster home. 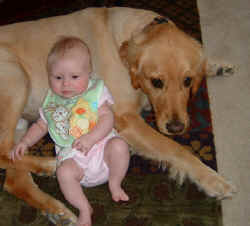 Our children at the time were 5 and 8 and this was their first dog experience. Cricket, while a sweet dog in general, took to growling at the kids sometimes, going to the bathroom in out of the way rooms, not coming when called, and on walks would pull the leash. My friend had also just gotten a dog and was having some of the same problems. She had heard about Leah and Canine Learning Center and asked if I wanted to sign up and I did. It was the best experience. I learned for the first time that it was a two way street in that I needed to learn as much about Cricket as she needed to learn from me. The Bare Basics class we took changed Cricket dramatically. By the end of the six weeks, she no longer was doing any of the behaviors that we didn't like and was beginning to be everything we had hoped she would be. We have just acquired a terrier mix puppy and I am signing us up for the Kindergarten Puppy class. Thanks Leah and Canine Learning Center! Rosco - Simon, Rosco, and I wanted to send a special THANKS to Leah Spitzer and Canine Learning Center for everything they have taught us. Since Rosco was just over 4 months old when classes started, we enrolled him into the Kindergarten Puppy Class. I have raised several puppies in my life, but this was my first time I took a structured training program, and it was worth every moment of it. This short six week program was packed full of valuable and practical information. We would definitely recommend Leah’s training classes to any dog owner. Because we were so pleased with Rosco’s change in his behaviors, we decided to sign up for the Bare Basics I class. 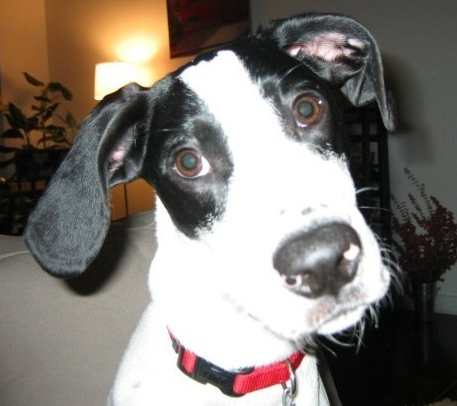 We truly think the puppy training classes has help Rosco become a better puppy and made us better dog owners. Mojo is now: Ch. Melkev's Designed with Mojo. Mojo won 3 Majors and finished his championship by the end of summer. 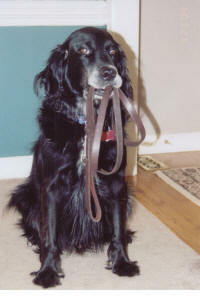 Your puppy and obedience training gave him the foundation to make it all possible. Best of all, Mojo is a joy to be around. I recommend your classes to everyone who gets a puppy. I thought that you might enjoy seeing the results of all of your help. Milly - Good afternoon! I just wanted to take a minute and thank you for what you did for my dog and me two years ago. 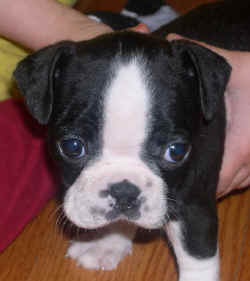 I brought Milly to you shortly after I got her. 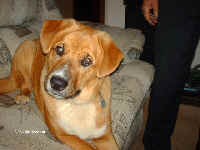 When I tried to return Milly to animal control because of her aggression problems, they were going to put her to sleep. Needless to say, I walked out of there still owning an aggressive dog. We did a few sessions with you as well as a class. I cannot tell you how different Milly is today. She has become such a sweet, happy dog! She bounces when walking and can't stop wagging her tail when talked to. Milly still likes to take my shoes and curl up with them, but she happily gives them back now instead of guarding and growling! Thank you so much for helping Milly!!! patience, guidance and support through Puppy Kindergarten and Bare Basics. We look forward to continuing our education with your help. 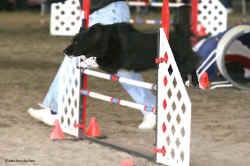 Tina Maria and Nina Wilbanks, 7/05 Training for our labradoodle, April, has proven to be incredibly beneficial. We cannot praise Leah Spitzer enough. She has shown us what is possible and with time and a little work April can become a well-behaved family member. Our thanks to Leah. 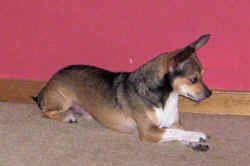 Our family received Lucky from a friend about a year and a half ago. 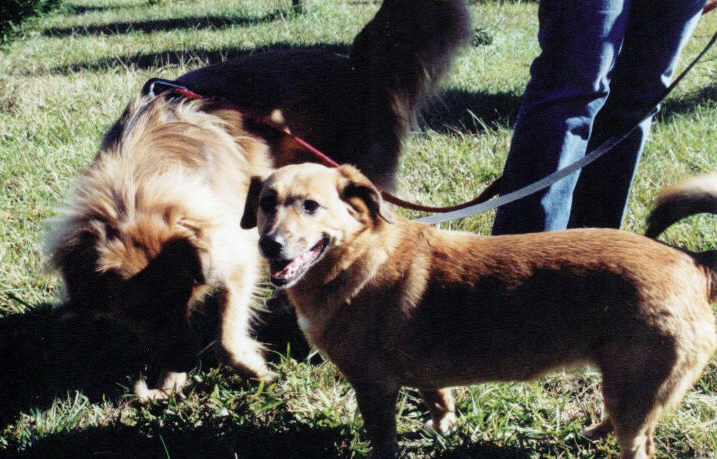 Although, Lucky seemed happy to be with us, she started nipping at my two boys (ages 9 and 6 at the time), refusing to come, running away and some urinating in the house. Things were quickly getting out of control with Lucky. As the primary caregiver for the dog, I was at a loss. 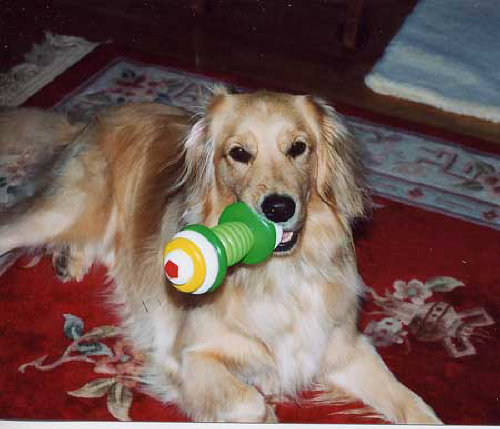 I had never owned a dog so I was pitifully unprepared to deal with Lucky's behavior problems. A friend recommended Canine Learning Center and Leah Spitzer. I took Lucky to see Leah and came away from the first private lesson feeling so much confidence in Lucky's ability to assimilate into our family. Leah was wonderful pointing out how we, as a family, needed to make a commitment to Lucky's training. Lucky went on to graduate from Basic Manners and Intermediate Manners. Leah was so helpful and supportive through the whole process. I truly believe in her commitment to help families incorporate their canine friends into their homes in positive and loving ways. Lucky has been such a blessing to us! I am so thankful to Leah and Canine Learning Center for being there to teach us about our dog and to teach our dog about us! 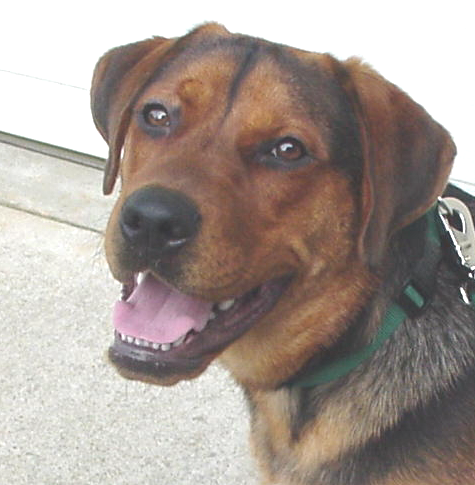 Bucky - When we adopted Bucky from the Humane Society of Hall County, he had "0" self-control. Not only did he bite and jump on everyone, he could not manage to even make eye contact or listen to commands. Some people would say he was an aggressive, hostile dog. Since he was a Rottweiller - Lab mix, this was particularly disturbing and could have eventually proved dangerous. Unfortunately, we had been instructed by another trainer to use negative techniques such as an "Alpha - Roll" and negative "staring" eye contact. When these methods were tried with Bucky, he only became more aggressive and uncontrollable. Then a friend told us about Leah and her method of positive instruction and we were hopeful. Leah assisted us in learning methods in which we could relate to Bucky as his leaders. Bucky learned that we were people he could trust to take care of him and guide him into that much needed self-control. It was not always easy, and we took our time, learning at our own pace. Bucky has successfully completed Puppy Kindergarten, Bare Basics I, and Bare Basics II. There is no doubt that he is a much happier, more secure dog, and that we are a much happier family as a result. 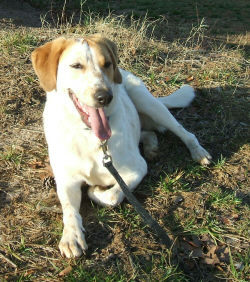 Bucky will be a year old in October and we are looking forward to the years of joy we know he will bring to our lives. Even though it sounds like a cliché, I can honestly say that we would never have made it to this point if it had not been for Leah Spitzer’s Canine Learning Center. Thank you so much. Richard, Phoebe, and Bucky 10/03 Update 12/05 Richard reports that Bucky is still doing great! Thank you so much for all that you have done for Bella & Meg. Good Afternoon. 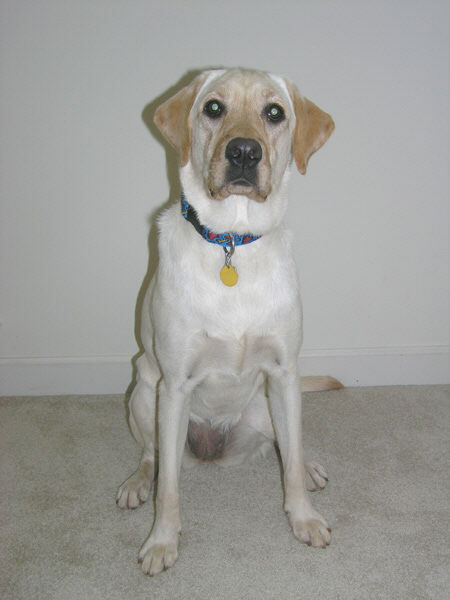 I wanted to thank you in writing for the six weeks of foundation (puppy class) that you laid for myself for training Rio--especially in light of your medical condition. I greatly admire your drive, dedication and patience in teaching owners of dogs for the ultimate well-being of the dog to strengthen the healthy bond between human and dog. I look forward to your next session of classes! learned so much from your class and I really enjoyed going. Your dedication and care for the dogs in the class is truly remarkable. I appreciate all that you have taught us and Thomas and will continue to work with her at home. Izzabelle sends her regards! Update 3/05 : It is hard to believe that only a couple or so years ago Molly tried to bite you when we decided to try and put a prong collar on her. 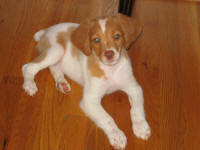 She now loves almost everybody, is very social and really enjoys competitive agility. We both are having fun but I should have started this before reaching (and exceeding) senior citizen status. She is patient with my mistakes. Thanks for the GREAT experience! Bella is my third dog, but this training was different than I'd ever been through. I feel closer to her than I did to my last dog. I just want to let you know how much I appreciate everything you've done for me and Jackson (and Darla) over the past year. We've learned so much - especially me! 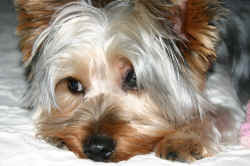 I especially like how you treat each dog individually, taking into consideration their personalities and specific needs. Its really been good for us. 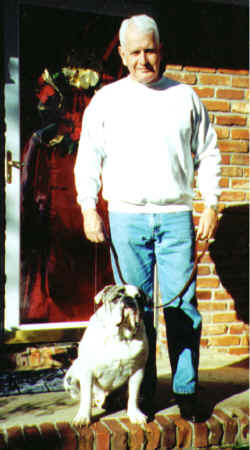 Thank you so much for what you've done for Droopy & Scooter & me. I would never have developed the relationship I have with each of them without you. 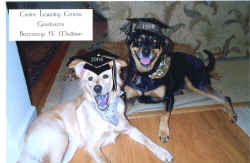 I know that both of my dogs are much happier than they ever would've been without your classes. Because of you we have many happy & well-behaved years to look forward to. 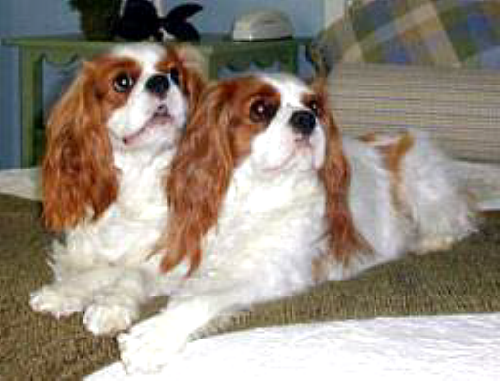 Madison is on the right, Buttercup is on the left. 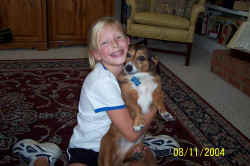 Madison & Buttercup - On 4/99 Shelley wrote: My husband and I had set up our picnic near a large sand pit....home to an abandoned rotty puppy. This puppy was extremely hungry (she ate my whole sub sandwich) and thirsty. When it came time to leave, the puppy followed us to our car.... It was at the vet that I had to face a difficult decision. Madison had shown strong signs of aggression. My vet advised that she could turn this aggression on my other two dogs, or even me. I was given the option of putting her down or taking a chance...Terrified...I sought the advise of the dog trainer I had utilized for my black lab. 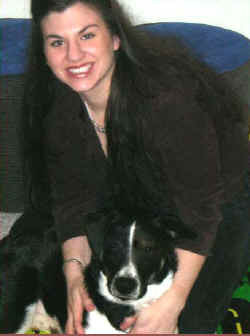 Leah Spitzer, I had observed, had a strong sense of commitment to dogs and if she felt Madison could be turned around, I was willing to try....There are all kinds of thoughts on the best way to train a dog...but Leah believes in the salvation of their souls....Madison graduated from Basic and Advanced Home manners. She has not demonstrated her aggressive behavior in over eight months....Her one year anniversary is coming up in July. I, for one, am delighted. Shelley McMahon **Update 12/04 - Madison is still doing well and Buttercup, the youngest, is now a graduate as well!